Hi everyone! Sorry it’s been a while since I’ve posted an update on my handmade pottery on the blog. I’ve been beavering away in the background and have a little to share with you. 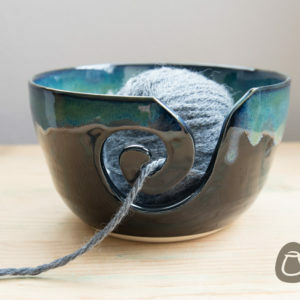 For a limited time (it’s a trial) you can get my handmade Yarn Bowls with free shipping to the UK. You don’t need a coupon code, simply select ‘2nd class’ shipping at the checkout. I’ve been in the workshop quite a lot recently experimenting with new techniques, colours and glaze effects. I don’t want to give too much away just yet until everything is ready to go but surface texture and new colours will make up a large part of my new range. You’ll notice that there are a lot of new items in my pottery shop be sure to pop over and take a look.